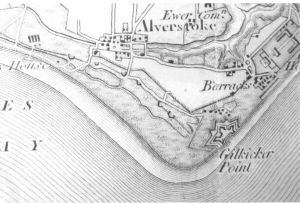 This early map of Gosport shows that the whole of the Stokes Bay area south of the Alverstoke village was originally inundated by the mouth of the River Alver. 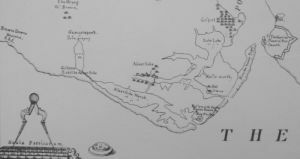 The map was reproduced by Henry Lewis in 1890, based on earlier maps by Burt, which he copied from a map of 1660s by Daniel de la Fabvolliere. 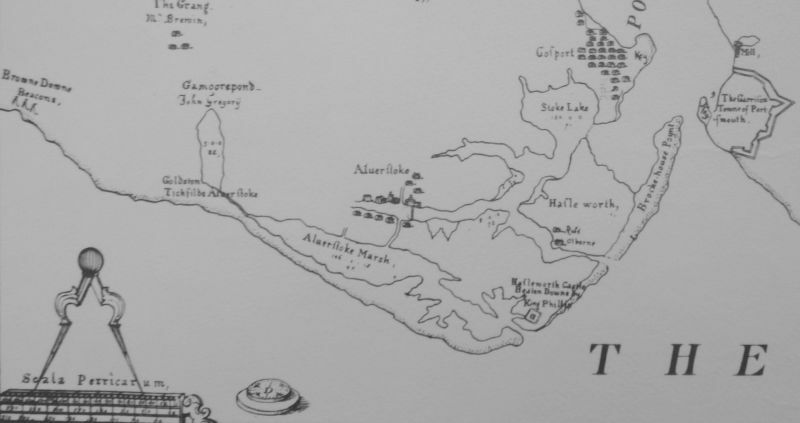 This in turn was copied from an earlier map of 1623 when someone was given a patent to enclose all areas of marsh etc for profit (known as the Wandesford grant). 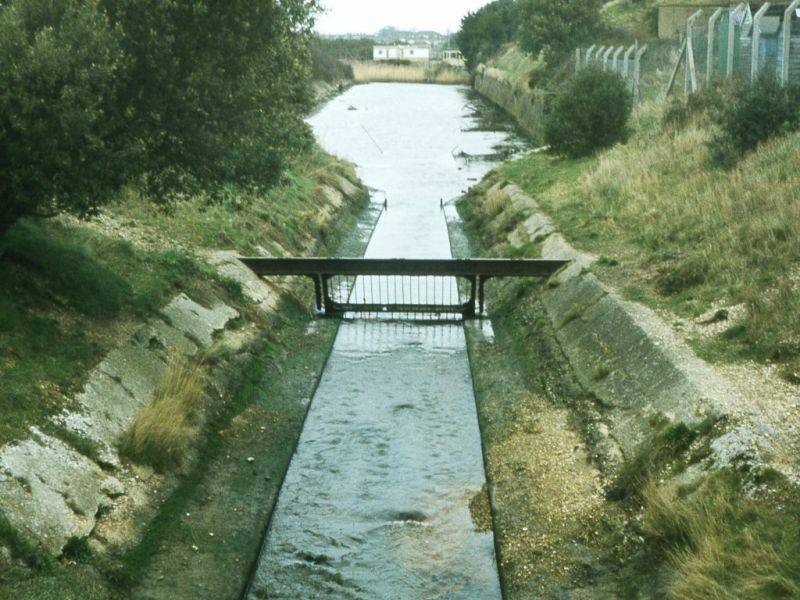 The River Alver has always been a feature of Stokes Bay. Its source lies in the Wildgrounds to the northwest of Gosport, flowing southwards to the sea at Browndown. 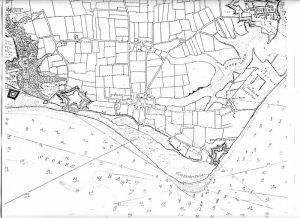 From here its original course was along the Bay parallel to the sea from West to East, flowing into the great morass at Gilkicker. 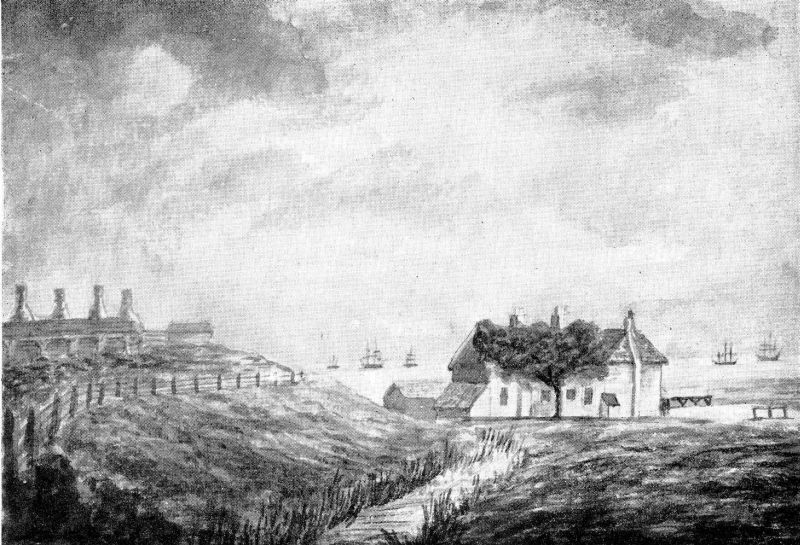 Along its route it gave its name to Alver Bank, and Alver Cliff. Taylor's map of 1759 again shows the route of the River Alver through Gomer Ponds to the Morass at Gilkicker Point but there seems to be a new exit at the western end of Stokes Bay. 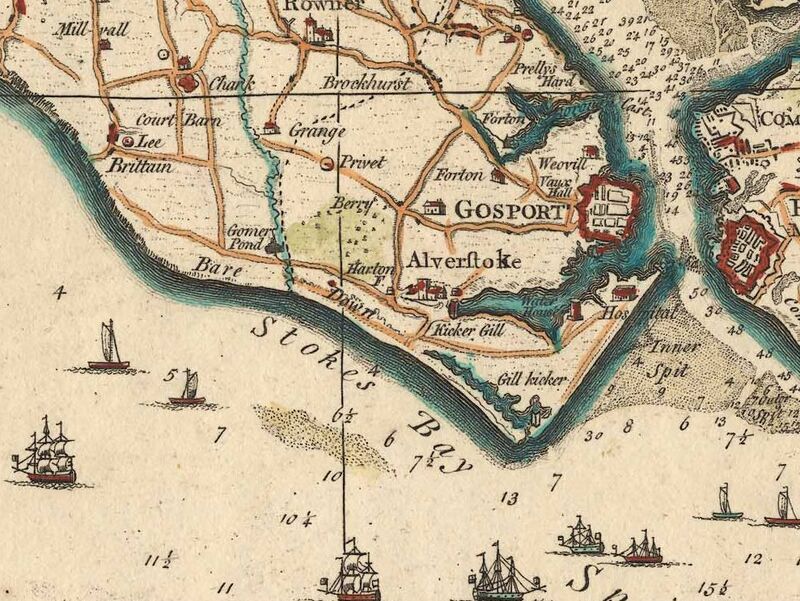 A map of 1782 showing the route of the River Alver along Stokes Bay. The Alver is shown here flowing into the lake at Gilkicker Point, adjacent to Fort Monckton. 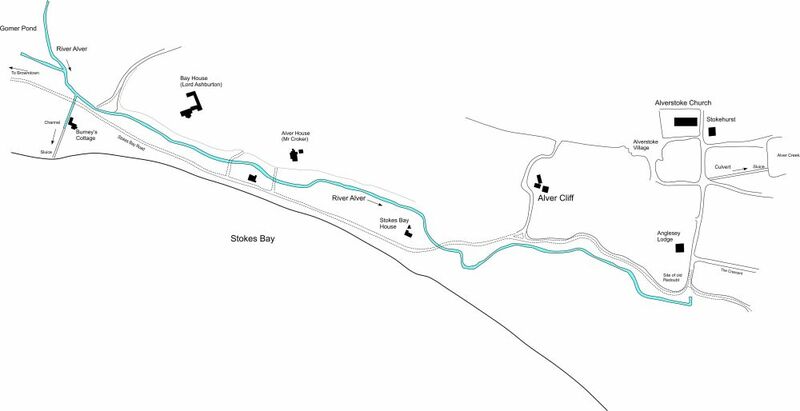 showing the route of the River Alver along Stokes Bay. 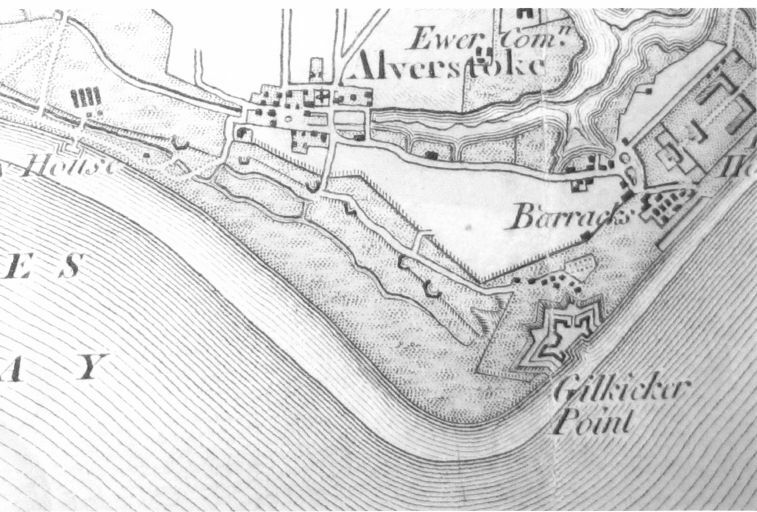 As in the above plan, the Alver is shown here flowing into the lake at Gilkicker Point, adjacent to Fort Monckton. Also shown is the proposal for a new fort at the west end of the bay. 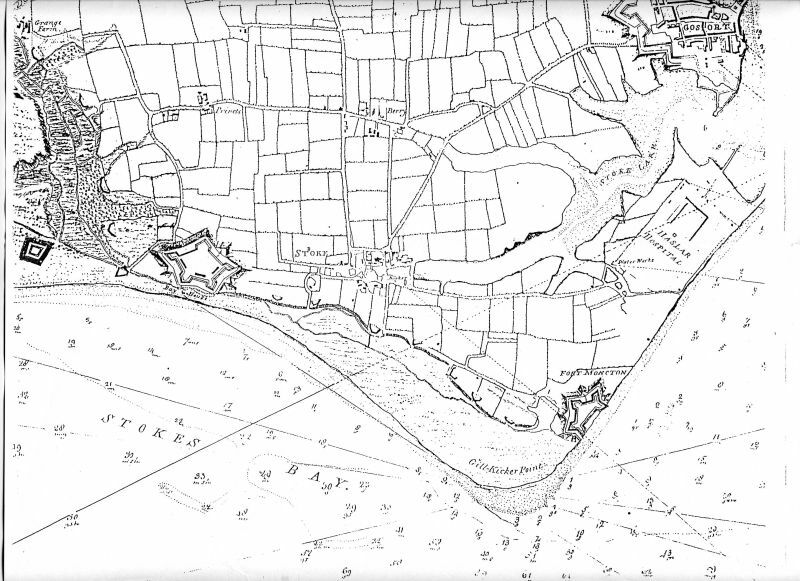 An Admiralty plan 1810 showing the River Alver flowing along Stokes Bay. By this time the lake at Gilkicker has been extended and shaped to form a water defence for the fort. An exit to the sea was provided by a sluice at its southern end. 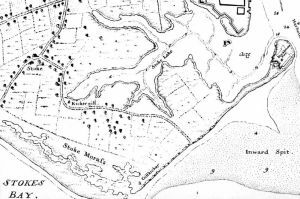 The Royal Engineers first began diverting the River Alver in 1847 in order to drain the morass at Gilkicker. 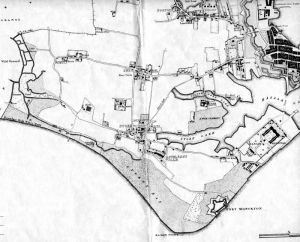 They first constructed a canal and sluice to connect the Alver to the sea at the western end of Stokes Bay where the Alver turned eastward along the Bay. They then opened the sluice so that the Alver communicated directly with the sea. 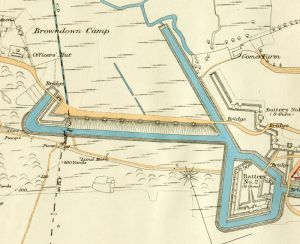 Next they connected the western end of the Alver, opposite Anglesey Road, via a culvert to Alver Creek. Now the river could flow into the creek allowing the Stoke morass to drain. 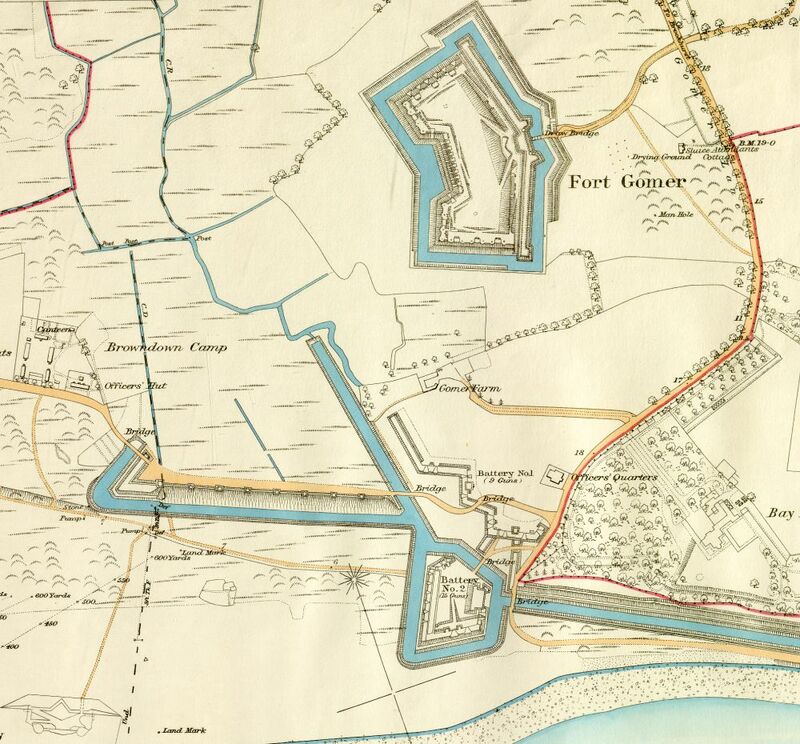 When the Stokes Bay Lines were constructed in 1860 the River Alver was diverted into the moat system at No.2 Battery. A system of sluices at various points along the length of the moat at Stokes Bay allowed the Royal Engineers to control the water level in the moat, the main sluice being at the southern end of the concrete canal to the west of No.2 battery. If an attack was imminent this sluice was to be closed allowing the River Alver to inundate the marshes to the west of Fort Gomer, so providing an impassable obstruction to attacking troops. This, combined with the opening of a sluice north of Fort Elson, would allow water to enter the ditch at Fort Elson. 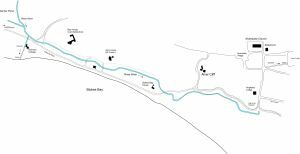 From here it would flow through a system of culverts into the ditches at Fort Brockhurst, then Fort Rowner, Fort Grange and on into the ditch at Fort Gomer. A sluice at Fort Gomer emptying into the River Alver at No.2 Battery would allow the build up of water to be controlled. This was the only way that water could be retained in the ditch at Fort Grange, which was otherwise dry. 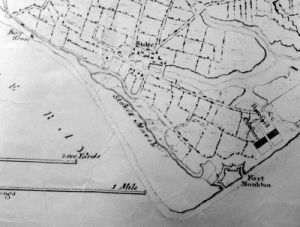 At No.2 Battery the river flowed all around the battery which became an island. To the west an earthen line of gun positions for movable armament formed a dam which, in time of need, could hold back the waters of the River Alver creating an inundation to the west of Fort Gomer. 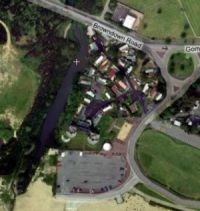 Stokes Bay Brick kilns, and Stokes Bay House with the little River Alver flowing eastwards along the Bay. 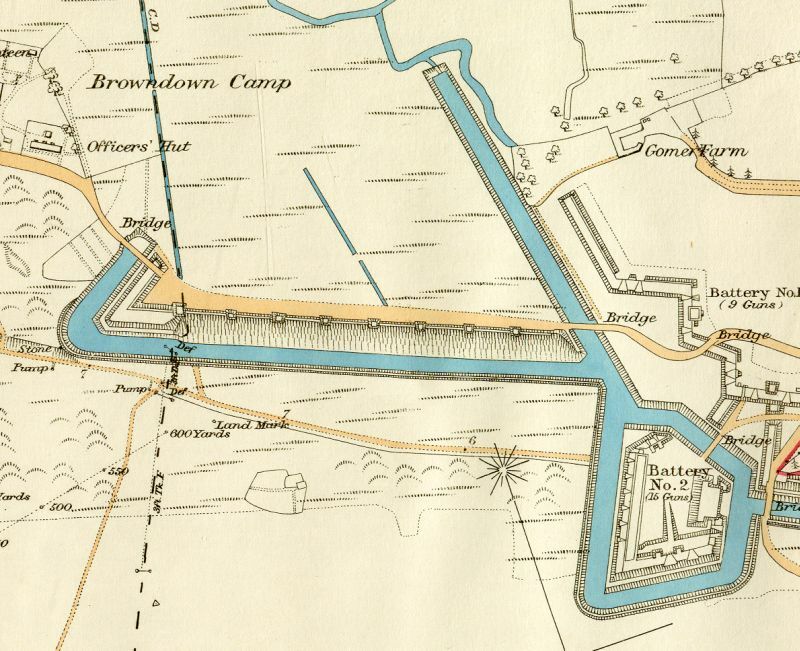 River Alver canal at No.2 Battery. where the sluice connects it to the sea. River Alver looking North. Site of No. 1 Battery on the right bank. River Alver looking North. Site of No.1 1 Battery on the right bank. River Alver looking South towards No. 2 Battery. River Alver looking South towards No. 2 Battery. The origin of the name 'Alver' for the river is not clear. 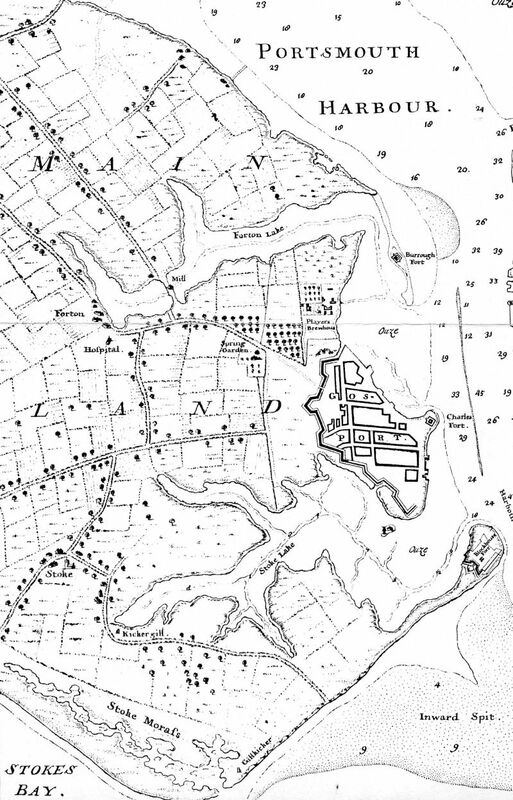 The first references to it as being the 'River Alver' on maps seems to date around 1860 when the RE diverted it into their moat. 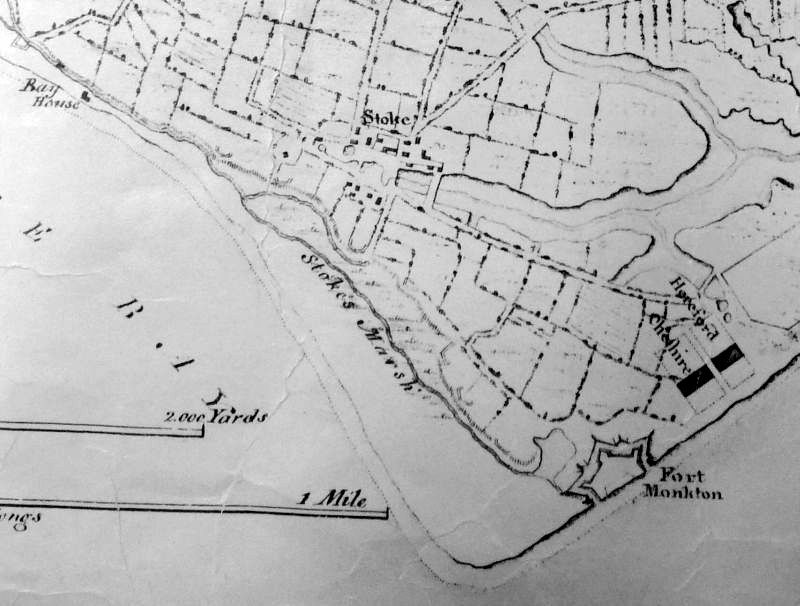 Maps prior to that show a river with no name.